Saffron is a spice that is obtained from the stigmas of the flower Crocus sativus Linnaeus, commonly known as Rose of saffron. The Crocus sativus Linnaeus is a plant of the Iridaceae family that is characterized by a purple flower color highlighted with red stigmas and yellow stamens. The flower of Crocus sativus Linnaeus is sterile because it is a hybrid that has been maintained over the centuries due to its valued stigma. Reproduction of this plant is by bulbs. Each flower of Crocus sativus Linnaeus has three stigmas of saffron, also called threads, which are joined at the base . Stigmas elongated trumpet-shaped, bright red is fading to yellow in style, also called corner. 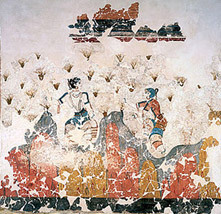 Although the origins of saffron are unclear, it seems almost accurate to say that it comes from the East, and its cultivation was widely known in Asia Minor in the days before Christ. One of the first historical references to the use of saffron comes from ancient Egypt, where it was employed by Cleopatra and other pharaohs as aromatic and seductive essence, and to perform ablutions in the temples and sacred places. Also in Classical Greece saffron was appreciated for its coloring and aromatic properties. It was used as a remedy for falling asleep and the mitigation of wine for scented baths and as an aphrodisiac. The Arabs used saffron in medicine for its antispasmodic and anesthetic properties. It was them who introduced the cultivation of saffron in Spain in the tenth century. Credited testimony of different order accredited that saffron was irreplaceable in the kitchen condiment hispanoárabe at that time. During the Middle Ages, saffron was a boom in Britain. According to legend during the time of Edward III a pilgrim brought a bulb of saffron hidden in a hole in his stick from the East to the town of Walden. There they planted the bulb and reproduced giving the city great prosperity. During the Renaissance, Venice emerged as the most important commercial center of saffron. Even then, the saffron was worth more than its weight in gold, and even today remains the world's most expensive spice. Unfortunately, its high price often led to adulteration, which was often harshly punished. Henry VIII, who was a devotee of the aroma of saffron, got to punish with death those adulterers. In India, saffron is an indispensable ingredient in many recipes for rice, sweets and ice cream. Used in Ayurvedic medicine for many recipes and in religious cults. In Saudi Arabia, an authentic Arabic coffee must have Cardamom and saffron. In northern Italy and southern Switzerland, saffron is essential in preparing the famous risotto. In Sweden, it is tradition to develop a pan with saffron on the day of Santa Lucia. In Spain, saffron is an indispensable ingredient in famous dishes such as Paella, Fabada or Pote Gallego. It is grown in Spain for over 1000 years, having great roots and tradition, being exported to practically every country in the world. The crop of saffron needs an extreme climate: high temperatures and dry in summer and cold in winter. The soil should be dry, chalky, airy, flat and treeless. 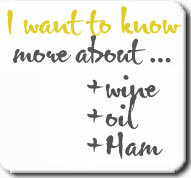 Qualities that meets the Castilian-Manchego plateau and that have made it one of the most productive regions in the world. The soil must be balanced in organic matter in order to reduce the risk of erosion, as well as a relative depth that allows the evacuation of the water so that the bulb is not damaged. Planting takes place between the months of June and July. This will make strips of about 20 cm deep and the bulbs are deposited in two parallel rows within each row. The separation between bulbs must be 10 cms. Planting bulbs is an arduous task, since each bulb should be placed by hand, making it necessary to walk bent over hundreds of meters. The sower follows the mule with the plow Roman ditches covering with soil. The harvest takes place between late October and beginning of November. The rose blooms at dawn and should spend as little time as possible in the stem as it withers and the stigmas lose color and flavor, so they are collected between dawn and 10 am. Once collected, is separated from the stigmas of the flowers, work is called "the desbrín of the Rose". The fact that 85,000 flowers are needed to obtain one kilo of saffron for consumption gives us an idea of how hard this work is. The stigmas of the saffron rose show a high humidity, so that their preservation is necessary to dry them. We thus come to the roasting process, they acquire the final form: bright red, hard and smooth. After the roasting process, the stigmas have diminished four-fifths of their initial weight, ie, for every kilo of raw stigmas we get 250 grams of saffron ready for consumption. For its conservation saffron is stored in large wooden crates lined with a metal plate inside them away from cold and heat and especially humidity. 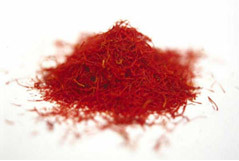 Sargol Saffron (All red saffron): This kind of saffron is pure and contains stigma without style. 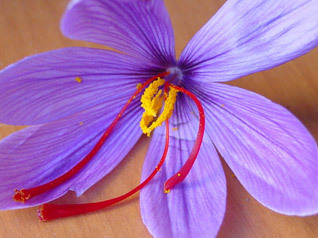 105 kg of saffron flowers produces 1 kilo of saffron sargol. 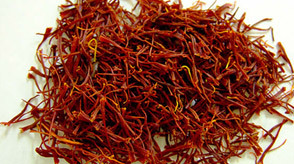 produces 1 kilo of saffron pushal. Style Saffron: This kind of saffron only contains the style without the stigma..
Humedad y materia volátil, % (m/m), máx. Cenizas totales, % (m/m) sobre una base seca, máx. Cenizas insolubles en ácido, % (m/m), sobre una base seca, máx. Solubilidad en agua fría, %(m/m), sobre base seca, máx. Safranal, expresado como lectura directa de la absorbancia a uso 330 nm, sobre base seca. Total nitrógeno, %(m/m), sobre base seca, máx. Coloring power: Saffron gives a yellowish color to the food that makes it more appetizing to the eye. Taste: The flavor of saffron is unique and indescribable. Used in proper amounts provides a slightly bitter, earthy recipes that are really tasty. Aroma: The aroma of saffron is very seductive. No wonder it was used in ancient times as a perfume. Saffron helps digestion, is carminative and emmenagogue-regulates menstruation. For good color and aromatic taste is sometimes used as a flavoring agent and especially color. In large doses can color of yellow urine, sweat and other secretions. The bitter principles of saffron give bitter tonic properties , while the crocetia, has a cholesterol lowering effect. 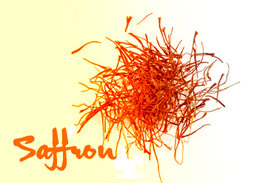 The saffron stimulates sweating and is used in case of fever. Can also be used either externally as it enters the composition of many oral formulations for treatment of mouth sores. 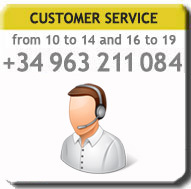 It is widely used to relieve pain caused by teething child. Saffron is one of the most valuable and exquisite spices. To maximize their active principles, most importantly, do not cook in a pan, and dry, not mixed with oil, because the saffron dissolved components in aqueous fluids. Not recommended to use a wooden spoon, as this will absorb these compounds. If we want to maximize the qualities of saffron, the ideal is preparing an infusion of warm water or milk, heating it for a time not less than 30 minutes. When the filaments turn white, it means that the assets of saffron have been dissolved. For use in cooking, we have to distinguish whether we have the saffron threads or ground. it in a hot liquid (depending on the recipe) until they release the color and flavor, or roasting, in case they are not, grinding to obtain a powder, then incorporate into the food preparation is dissolved in a little water or broth. It is typically used 4-6 threads per serving. The ground saffron is added directly to food dissolved in a bit of water or broth.